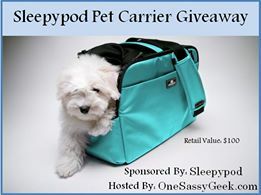 Sleepypod was generous to give One Sassy Geek a free Sleepypod Atom for their dog to review. Read all about One Sassy Geek’s review of the Sleepypod Atom. Be sure to complete the mandatory entry on the Rafflecopter. Somewhere there is lots of space, she loves to run and play fetch with anything she can put in her mouth! I’d love to take my dog to Hawaii because I would get to go, too.